The FS5 Spectrofluorometer is designed to meet the highest measurement specifications in the research and analytical markets. To achieve optimal sensitivity, resolution, and acquisition speed, we select only the optimal performance photomultipliers in temperature stabilised housings, and utilise an optical design that includes plane, spherical, toroidal, ellipsoidal mirrors and optimised mirror coatings; the FS5 is truly unrivalled in its spectral performance and sensitivity. Not only does this superior design guarantee the highest sensitivity and broadest wavelength coverage, but it has also been optimised for a small bright focus at the sample position. This is important for measuring small sample volumes and benefits many sample holder attachments like a plate reader, fibre launch optics mounting, titrators and sample positioners. The standard FS5 has a number of upgrade routes that are unique in its class, including spectral range extension up to 1650 nm, Fluorescence and Phosphorescence Lifetime measurement capabilities, polarisation / anisotropy and much more. Please see the upgrades tab for more information. 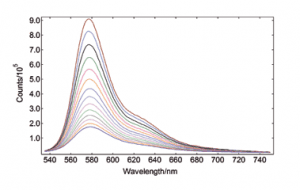 Fluoracle® is the operating software for the FS5 Spectrofluorometer. It controls all FS5 steady state and time-resolved spectrometer features with a straightforward design concept: focus on all modern photoluminescence spectroscopy applications and provide a user-friendly interface with ‘ready to publish’ outputs. Whether you select a basic spectral scanning version of FS5, or you go for an advanced version that includes TCSPC lifetime measurements or integrating sphere measurements, the all-inclusive software will provide instrument options automatically, from data acquisition to analysis and presentation. 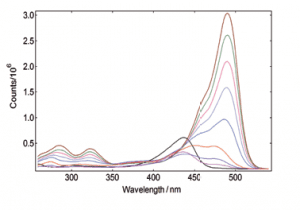 Upgrade to FAST Software for advanced fluorescence lifetime analysis. Rhodamine B, unlike other Rhodamine derivatives, has a chemical structure that is not entirely rigid. Consequently, the diethylamino groups interact with the solvent’s temperature, affecting the molecule’s excited-state population and dynamics through torsional motion. 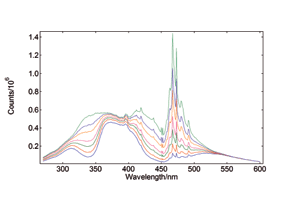 This causes the fluorescence intensity to have a strong dependence on the sample temperature, which can be seen below as measured with the TE cooled sample holder. 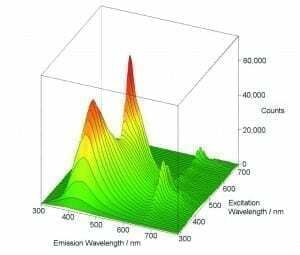 Fluorescence excitation spectra are more selective than absorption spectra, as they reveal, by virtue of the selected emission wavelength, where the molecule can absorb photons to prodcue a particular emitting species. 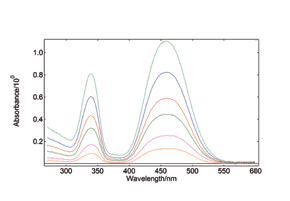 Accurate excitation spectra require a sensitive instrument, as the concentration of the sample must be kept low to avoid inner filter effects, and require reliable spectral correction to ensure proper spectral representation. In synchronous spectral scans, the excitation and emission monochromators scan at the same time with a fixed wavelength offset, typically from 0 – 20 nm of offset pending the application. For dilute mixtures, this type of scan is used to identify species with a strong overlap between absorption and emission. Synchronous scans, together with the integrating sphere attachment, can also be used to measure the transmission/reflectance/absorption spectra of strongly scattering powders. YAG: Ce powder, diluted with BaSO4 to study the effect of re-absorption/emission, concentration change from 100% down to 20%. 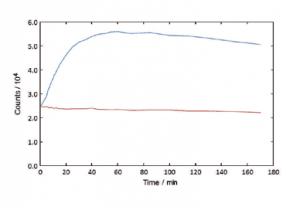 The software wizard is used to calculate the Absorbance (left) from the raw data of synchronous scans (right). The FS5 can record the time course of a fluorescence signal, and, at the same time, record the signal transmitted through the sample. This enables experiments to be performed with chemically or biologically unstable samples, or with samples where very small changes need to be measured very accurately. The transmission detector is standard in the FS5. Caspase Assay, fluorescence time course recorded for a 100% enzyme addition (blue) and a 0% enzyme control (red). 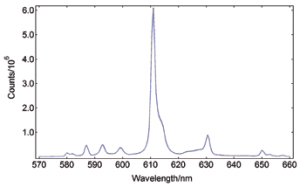 Peptide cleavage is recorded by an organic dye excited at 400 nm, emitting at 460 nm. Excitation-Emission Maps (EEMs) provide a ‘Finger Print’ of complex mixtures of substances. These maps are typically measured either by a series of emission scans with stepwise increase, or for synchronous maps, by a series of synchronous scans and stepwise increase of the excitation-emission offset. A map measurement over a wide range of excitation and emission wavelengths, as shown here, can only be performed properly if higher order scatter is automatically removed during the measurement; the FS5’s built in automatic filters, along with real-time correction for background noise and spectral efficiencies, allow these measurements to be seamlessly performed by even the newest users. Fluorescence quantum yields can be measured by using the optional, sample chamber mounted, integrating sphere. The absolute method directly compares the number of absorbed and emitted photons through measurement of a blank-reference and a sample where their spectra can be integrated with respect to each other. The quantum yield calculation is made using a wizard within the operating software. Quinine bisulphate in Perchloric acid. 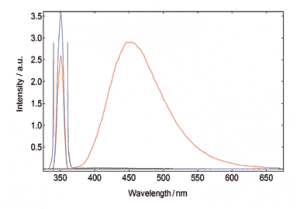 The red curve shows the scan over the excitation scatter at 350 nm and the emission of the sample, the blue curve shows the scatter of the blank measurement. The sample and blank-reference emission range (370 – 700 nm) has been increased by a factor 100 for better demonstration. The lighting industry requires precise determination of the colour co-ordinates of fluorescent powders. 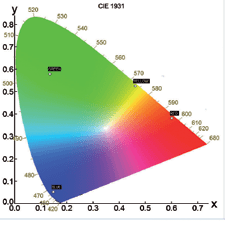 The FS5 and Fluoracle Software provides Chromaticity analysis tools for the determination of colour co-ordinates and luminosity values using CIE 1931 and CIE 1976. 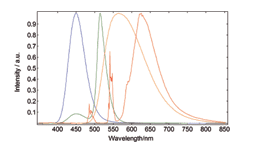 The example shows four commercial powders with blue, green, yellow and red emission. 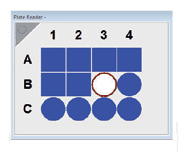 Multiple sample measurements can be made using the plate reader sample holder accessory. 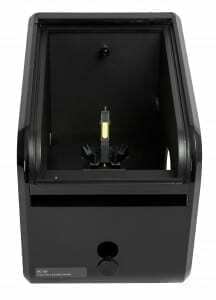 This can be used for liquid samples with commercial plates of up to 96 wells, but is also suitable for routine quality assessment of fluorescent powders. As with all the sample holder accessories, this is also compatible with the FS5 upgrade options, including the lifetime upgrades. FS5 – MCS The instrument has all the features of the standard FS5, plus the capability to measure sample decays with lifetimes of over one microsecond (phosphorescence, lanthanide decays). The changeover between the standard continuous xenon light source and the pulsed xenon flash lamp is software controlled and the acquisition mode automatically changes from standard photon counting to time resolved photon counting. The software incorporates fitting and reconvolution analysis for lifetime evaluation. The instrumental response function (IRF) of this instrument is 2 microseconds. Lifetimes from <10 μs to >10 s can be accurately measured. FS5 – TCSPC The instrument has all the features of the standard FS5, plus the capability of fluorescence lifetime measurements in the picosecond, nanosecond and the lower microsecond (<50 μs) time range. The FS5-TCSPC version requires picosecond pulsed diode lasers and LEDs for excitation, which are simply attached to the FS5-TCSPC housing and are compatible to all sample holder options. The software is fully compatible with all measurement options and offers numerical reconvolution and curve fitting. Note that the picosecond diode lasers (EPL series) and the picosecond pulsed LEDs (EPLED series) come with different output wavelengths. More than one of these picosecond pulsed light sources may be required to cover your range of applications. TCSPC lifetime measurements with the standard FS5 detector will have an instrumental response function (IRF) of approximately 800 ps (FS5-TCSPC), enabling <100 ps lifetimes to be resolved. The exact value depends on which EPL or EPLED model is used. For challenging applications the IRF can be improved by fitting a SECOND, faster detector (FS5-TCSPC+). Using an EPL as an excitation source in this configuration will result in an IRF of <200 ps, enabling approximately 25 ps lifetimes to be resolved (depending on the source used). FS5 – NIR This is a unique upgrade route that is only available to the FS5. The FS5-NIR has a SECOND detector fitted to expand the operating spectral range without sacrificing the performance of the standard instrument. There are two NIR versions available: FS5-NIR is fitted with an extra-cooled side window PMT and selected grating for sensitivity up to 1010 nm; FS5-NIR+ is fitted with a TE cooled NIR-PMT and NIR-grating for sensitivity up to 1650 nm. Both options are based on single-photon counting electronics for maximum sensitivity and compatibility with any of the lifetime options, should they be added. FS5 – POL This upgrade comprises the standard FS5 with fully computerised polarisers in both excitation and emission arms. 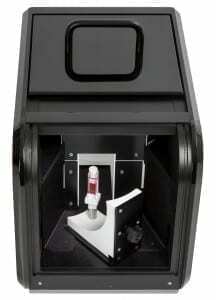 The polarisers enable polarised fluorescence and fluorescence anisotropy studies. Automated measurements and generation of anisotropy curves, both raw and G-factor corrected, are supported by the software. If combined with the TCSPC option, time-resolved fluorescence anisotropy measurements and analysis will also be possible. FS5-POL uses Calcite polarising prisms with an operational range of 240 nm – 2300 nm for both excitation and emission. This ensures compatibility with the NIR options FS5-NIR and FS5-NIR+. We have measurement modules available for practically all applications. 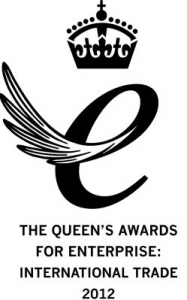 These can be purchased at any time and can be easily installed by the user. The installation takes no more than a few seconds. The Fluoracle software automatically recognises which of the measurement modules is in use. This reduces the complexity in the user interface and ensures ease of operation. The standard Fluoracle software package can be upgraded to include the FAST software package. 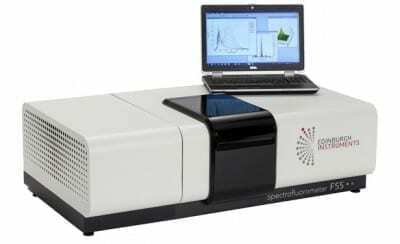 This is used for advanced fluorescence lifetime analysis and includes features such as lifetime distribution analysis and exponential components analysis. Please click on the link to learn more about FAST software or contact us directly.